DIY cheese is easier than you think! Impress your guests with this selection of very cheesy (and homemade) offerings. The art and love of making cheese from scratch - it's a beautiful thing. And to excite you to take on your very own dairy creations, we dug deep and found some delectable ways you can make your very own at home. Don't worry, this doesn't mean you're giving up a life of cheese purchases, but if you're looking for a little DIY food project that is very satisfying, try your hand at these cheese recipes that'll create smiles all round. Labna or labneh is a Middle Eastern staple. It’s made by removing excess whey from salted yoghurt, which results in a velvety, cream cheese-like spread with a lightly sour note. It’s eaten on bread and topped with olives, mint, tomato, cucumber and olive oil. Silvia Colloca shares this beautiful cheese making by-product! Here is a recipe for fresh ricotta, that's perfect served warm with toast or drizzled with runny honey or grape must. How do you enjoy it? Making your own mascarpone at home is easier than it sounds and don't worry as The Seasonal Cook O Tama Carey has us covered with this easy recipe that produces a creamy & slightly sour mascarpone. For those who already heart haloumi, take it next level by preparing and perfecting your very own slab of salty goodness. Great in pies and salads, haloumi needs no back-up as it holds its very own, simply grilled with a little cracked pepper and lemon juice. Get Matthew Evans' recipe here. This southern Italian wonder has got quite the reputation and this batch will keep several days in a salted brine... bigger question is, will it last that long? A new season Coratina olive oil is my choice for this dish as it's light and buttery and possesses a slight nasturtium-like flavour and pepperiness. This is a great dish to share with friends who aren’t scared of embracing oily messiness. Paneer is homemade, unsalted, white cheese. It has a fresh farm cheese-like quality and a dense, crumbly texture that works wonderfully with Indian spices, but equally well with flaky sea salt, freshly ground black pepper and a drizzle of quality olive oil. Hot tip! Matthew Evans recipe spikes it up more with extra chilli and garam masala, especially if making a full Indian meal. Get his recipe here. Last but certainly not least, it's the cheese that has been around for several thousands of years and is also one for those who want to get into some seriously good cheese making. Feta is simple to make, very versatile and can be enjoyed straight away, no ageing required. You can make feta cheese with this easy recipe from Green Living Australia, or even easier, buy some good feta and take it to a marinating place with this easy recipe! 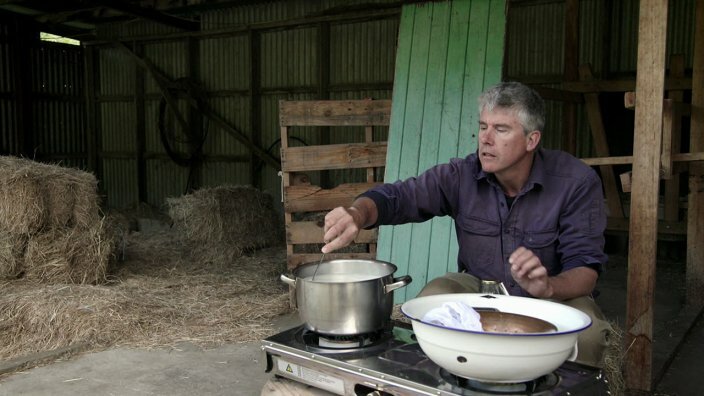 Gourmet Farmer Matthew Evans shows us how to prepare fresh cheese! Fresh cheeses are the babies of the cheese world - cheese in its youngest, purest form. So, think ricotta, soft goat's, mozzarella & paneer, just to name a few. The key is top-quality milk. For more from Gourmet Farmer, visit the Gourmet Farmer program page for recipes and to find out more about the show. Visiting the local bakery is part of everyday life in Bosnia and the bakeries always have a good variety of kifle (rolls) to choose from. Salted or cheese-filled are popular but you can find Frankfurt sausage versions, or for something a little sweeter there's chocolate or jam-filled, which are also popular. Traditionally shaped, these cheese kifle are dotted with butter before baking giving them a lovely tender, rich crumb that makes them completely irresistible. One of my all-time favourite pastry mouthfuls, gougères make the perfect party food – make them ahead of time, reheat just before serving and watch them disappear! Feta is synonymous with Greece. Although found on Greek tables year round, the sharp tang of this brined curd cheese shines in the hot Mediterranean summer, paired with watermelon and olives, tossed in refreshing salads, or eaten by itself with olive oil and dried oregano. Alevropita, a specialty of Epirus in northwestern Greece, is similarly beautiful in its simplicity. Essentially a doughy flatbread topped with feta and flavoured with oregano, it requires minimal ingredients and is easy to prepare, making it perfect for a picnic in the warmer weather. A great way to gather friends and family around the table, Swiss cheese fondue is winter comfort food at its best. If you don’t have a caquelon (fondue pot), a claypot or stainless steel pot can be used for this recipe instead. Queijo coalho is both the name of a firm, salty Brazilian cheese and the snack that it inspired. The cheese is barbecued on skewers and served with a garlic or molasses sauce.